Tomorrow I have to pick up my husband's suit jacket from the cleaner's . I am determined not to let this be a traumatic event for me and I am quite sure I'll make it home alive. But in the event I don't I'm writing this post so the world will know what happened to me. When I was a little girl my mom was a good, responsible mother. She taught me to look both ways (twice) before crossing the street, not to touch hot things on the stove, and to carry scissors with the point directed toward the ground. She also taught me the dangers of plastic dry cleaning bags. 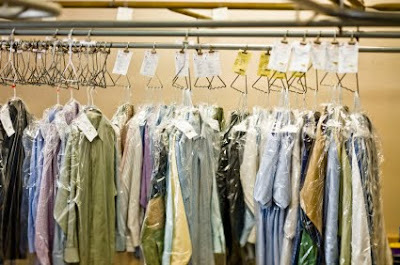 Did you not know that plastic dry cleaning bags are deadly? Well they are. I was taught to immediately remove the plastic wrapping from over the freshly dry cleaned clothes, tie the bag into a knot or two and throw it away. And of course I was taught to never put my head in the bag because I could suffocate. I don't blame my mother for this fear. I'm sure I took her gentle but firm warnings and simply ran in the direction of insanity with them all on my own. But I kid you not when I say that I truly look at plastic dry cleaning bags as weapons in the same category as ... um... say hairdryers or mattresses. They can all kill you, right? If you plug the hairdryer in, turn it on and throw it in the bath tub or .... I don't know.... maybe lie under the mattress with a 300 pound man lying on top of it. While I'm confessing my deranged fears I might as well tell you that I also never use butcher knives for any reason because my mom once accidentally dropped one on my foot while icing a cake. I know. But I forgave her back in 1972 when that happened and I hardly ever think of it... except every time I see a butcher knife, of course. And the other day a bloggy friend mentioned pressure cookers in her post and that reminded me of another fear I have. Now my mom used her pressure cooker a lot when I was growing up and though she let me know they were potentially dangerous (and I could see that for myself of course, with the thing sputtering and hissing like it did) she never told me I couldn't use one. Unlike the plastic dry cleaning bags, we actually kept the cooker in the cabinet ready for use. But somewhere along the way I determined that only mothers could use them and somewhere further along the way when I became a mother I determined that I still didn't qualify to use them. And I never would. So when my bloggy friend said she had bought one and I'm almost certain she's younger than me, I was pretty sure she had broken the law. Again, psychotic. All this to say, fear is a crazy thing, huh? It gets planted in our minds through the most innocent seeds, like a dandelion seed that wanders into your flower garden. Then with just the smallest amount of encouragement (a TV murder mystery here, a WARNING tag on the mattress there, a sputtering, steaming release top there), that fear grows in leaps and bounds. Before you know it your fear has overcome reason and it is keeping you from doing even the most normal things (like cooking green beans, for pete's sake!). I do hope you realize that my little confessions have all been offered lightheartedly today. Truth be known, these fears do indeed still skate through my mind each time I pick up the cleaning or pass by my block of unused butcher knives, but I recognize them for what they are: silly, inordinate fears based on a child's misinterpretation of helpful information. I don't blame my mom, I repeat, I don't blame my mom for any of my psychosis. I own it clear and free. But fear itself is very real. And the crippling damage it causes in our lives is real too. I hope fear, silly or well-founded, is not keeping you from doing anything you're supposed to be doing today. I say well-founded because sometimes fear does play the healthy role of opening our eyes to potential hazards, but we should never operate out of fear alone. It should only act as a you-might-want-to-consider-this sort of guide in our minds. But God's truth and His instruction should trump it every time. So let's go out there and use our knives and pick up our cleaning and dry our hair with a sound mind today. And while we're at it, let's parent our children and do our work and start something new and make that dreaded phone call and make that new investment and ....whatever you have to do .... without fear too. Feel free to make me feel better about myself and share your stupid, psychotic unfounded fears with us today. Or if you have real fears that are hindering you, you can share those too and I'll be glad to pray for you. You can leave a comment for us all to see or you can contact me privately through the Contact button on the tool bar above my posts. I'd love to hear from you!